Launched in 2012, Lucks Casino appears from the outside to be a pretty generic site, however appearances can often be deceiving. To exist in the competitive online casino market for four years plus, a site has to be bringing something new, so what is it that Lucks Casino has that has helped it enjoy popularity for so long? The originality certainly isn’t in the appearance of this site, although the purple to blue gradient background is attractive, it does look like it was put together on clipart, or at best on the first day that somebody discovered Photoshop. The Lucks Casino logo is a gold coin with the name written in red and black, with a union flag design through it, which is fine, not unique in any way, but attractive enough. The banner at the top of the homepage is colourful and exciting, although the images are about as generic as you will find, and navigation is simple which is certainly a plus, but there is nothing at all different here. Games at Lucks Casino come courtesy of Microgaming, NextGen Gaming, NetEnt, and NYX Gaming amongst others, so you know there will be some variety here. Slot games include new releases like Jimi Hendrix, Guns ‘n’ Roses, Bloopers, and Drive: Multiplier Mayhem, and you’ll also find some old school favourites in the shape of Starburst, Tomb Raider, Gonzo’s Quest, Game of Thrones and more. Table game lovers can enjoy varieties of blackjack, poker, and roulette, many of which are also playable in the live casino, which is one of the strongest selling points of this site. 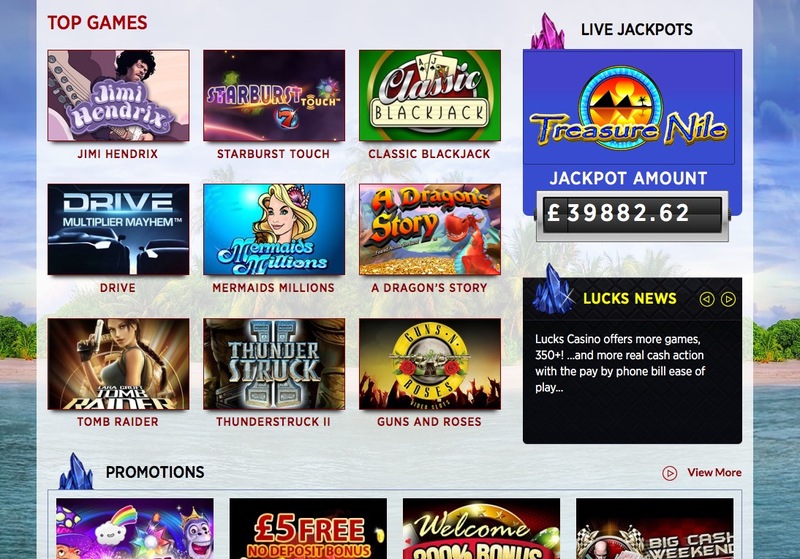 Lucks Casino is nothing to write home about, but if you are after a consistently good site, then this is a very good choice, especially recommended for newbies.